Wow! This blanket was definitely the most time-consuming project so far. It took me over a week to finish. The pattern I used was called Easiest Baby Blanket from Ruhamas.com. Originally I planned to knit it with size 15 needles and by holding two strands of yellow sport weight yarn together throughout. 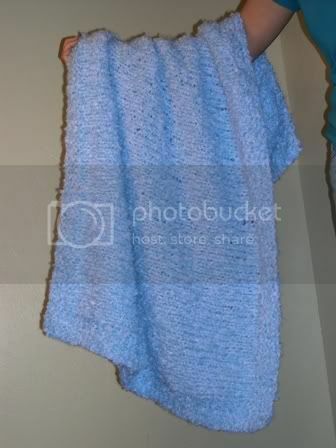 However, I knitted a few rows with that yarn and I did not like the big holes it created (though later on vacation I saw a very nice baby blanket knitted with large needles and light yarn - in the finished product the holes didn't look strange). So I went back to the store and purchased Red Heart Baby Clouds super bulky yarn in Blue Sky. The bulk of this yarn makes the holes much smaller when knitted. Unfortunately, I did not follow the directions very well. For some reason I decided that casting on 75 stitches was not enough, so I cast on 90 instead. This made the blanket very very wide - about 49 inches. I then knit 102 rows, which made it 34 inches long. I had been hoping for a finished blanket that was square, but by the time I got near the end of my third ball of yarn I could see that if I did make it square it would be gigantic so I stopped. The hardest part of this blanket was alternating knitted rows with purled rows. It seems to take me twice as long to purl a row than to knit one. I probably could have finished it a lot faster if I had just knit the whole thing. It may not be the prettiest blanket ever, but hopefully my friend (and her baby!) will like it.